Diabetics should pay attention in daily food menu. For example, avoid white rice and replace them with brown rice or brown rice. In addition to rice, food, whatever is the abstinence of diabetes? For diabetics, selecting food intake is very important. Because, there are certain food groups that should be consumed, but there are also other food groups that are best avoided. The goal is to let diabetics have blood sugar levels are controlled. For diabetics, food intake setting is one form of treatment that must be traveled. 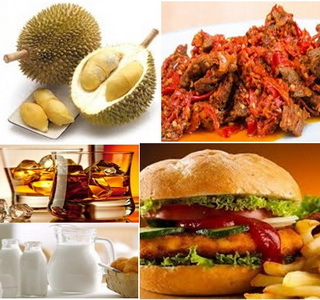 This is a list of good and bad foods for consumption for diabetic patients. The body needs carbohydrates in addition power. But, avoid consuming carbohydrates in the form of white rice, white bread, and fries. Also avoid cereals that contain a lot of sugar, but few fibers. Instead, choose Brown rice, bread from whole-grains, or a baked sweet potato. Abstinence is the next diabetes fried meat, poultry skin, fried fish, and fried tofu. Diabetics can get protein from meat; skinless chicken breast meat is boiled, steamed or boiled tofu, grilled fish, eggs, and nuts. The dairy products be abstinence diabetes is full cream milk, ice cream, yogurt, and cheese. But, the diabetics can still consume other dairy products, such as skim milk, low-fat yogurt, and low-fat cheese. The fruits contain fiber, vitamins, minerals, and carbohydrates, but it has a fat content and low salt. Diabetics should avoid bottled drinks, fruit flavored drinks fruit juice that is already mixed the sugar, canned fruit and already added sugar syrup. Fruit jams already added sugar should also be avoided. As an alternative, choose fresh fruits, fruit juice is not the original added sweeteners whatsoever, or jam that does not contain sugar. Diabetics should also avoid drinking sweet tea, coffee with sugar and cream, fizzy drinks, alcoholic drinks, and drink the stamina Enhancer (energy drink). In addition to white water, the diabetics can still consume the tea without sugar, coffee with low fat milk and sugar substitute. Vegetables are a good source of fiber for health. However, avoid eating vegetables plus sauce, cheese, and butter. In addition, try to set aside canned vegetables which have been added a lot of salt from the daily menu. If salt consumption should be limited, avoid vegetables that had already been made into pickles. Choose fresh vegetables. Can be eaten raw or processed by way of briefly steamed or baked. If diabetics continue to eat foods that should be challenged, blood sugar can experience a spike. As a result, there can be various complications, such as increased risk of cardiovascular disease and nerve damage. Cardiovascular diseases that can be suffered include heart attack, stroke, and narrowing of blood vessels. Nerve damage can cause symptoms of tingling in the tips of toes, numbness, and even pain, which can spread to the upper limbs. This complication occurs because high sugar levels can injure the capillary walls (small blood vessels) that serve to nourish the nerve cells. If nerve damage occurs in the digestive tract, this can cause diarrhea and constipation. Erectile dysfunction can also occur in men due to nerve damage. Intake of healthy foods can help meet the needs of nutrition, while keeping your blood sugar levels stable. Therefore, if you suffer from diabetes, should avoid food abstinence of diabetes already mentioned above. You can also consult a doctor of nutrition related settings menu foods that suit your conditions.